If you are looking for distressed furniture styles, then obviously our antique French furniture is naturally distressed from at least once century of being loved and used! Sometimes though, our customers want new pieces that just look old… they want antique-inspired furniture that is newly crafted but with an aged and distressed look. We have plenty of options for new furniture and home decor on our website so we are happy to help out! Today I’m going to tell you how some of our furniture makers work their magic to achieve their distressed furniture finishes. Some of the best antique-inspired furniture is crafted using the same techniques that were used for the original antiques. 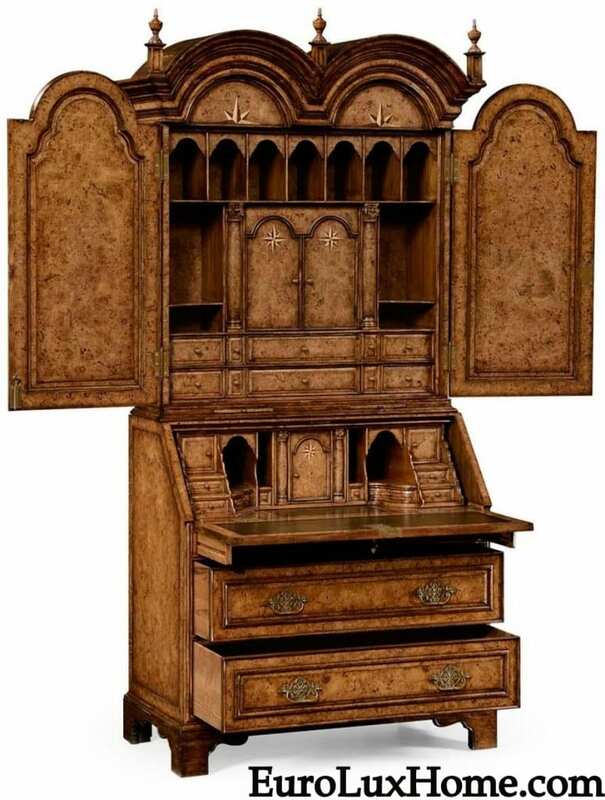 Jonathan Charles Fine Furniture is a good example – their reproductions include hand-cut marquetry and intricate carved details. Then their pieces are aged to look like an antique. 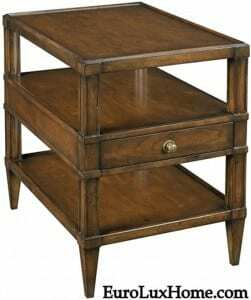 This Jonathan Charles distressed bureau in the Queen Anne style gives you a taste of their skills! That requires special knowledge to get the distressed furniture look. Sowter says that his craftsmen understand where a piece of furniture would have bangs and knocks and scrapes after years of use, and where it wouldn’t. This close-up of a section of the oak bureau shows what he means. 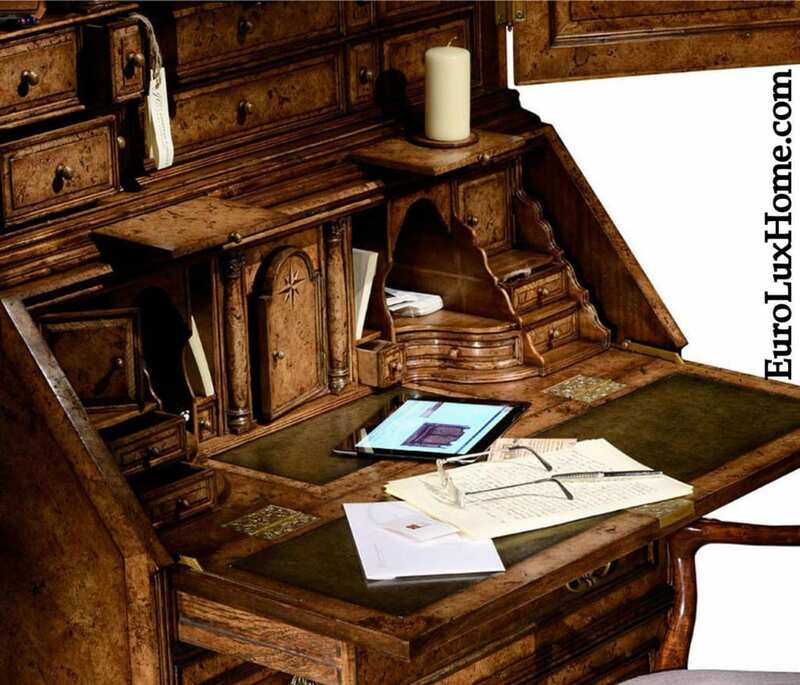 The bureau is a replica of Queen Anne desk designs dating to 1710, more than 300 years ago. The desk looks incredibly authentic, you could certainly believe that it’s been used for three centuries. Another way that distressed furniture gets its aged look is through hand-planing. The furniture makers at Scarborough House are brilliant at this. 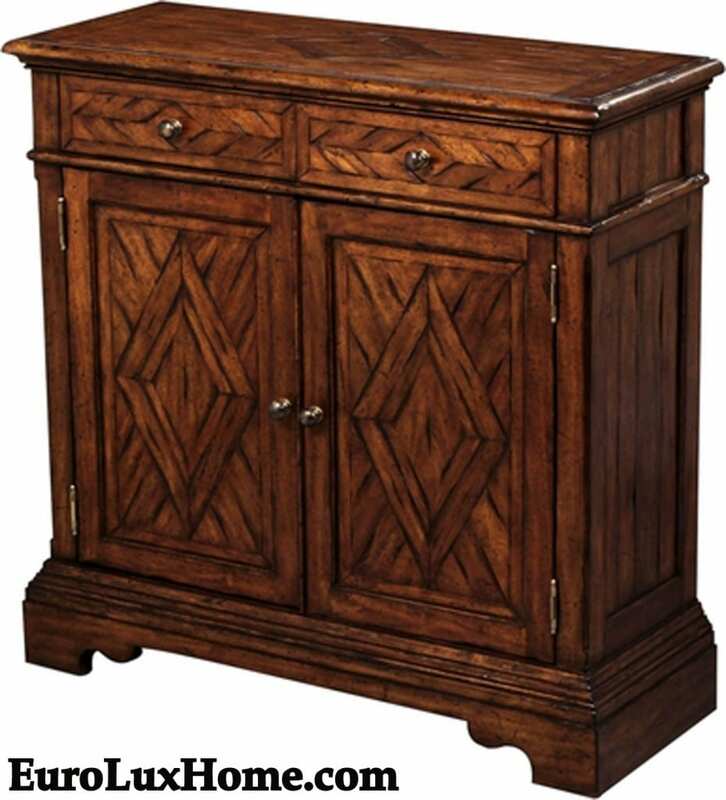 This heavily distressed Scarborough House chest cabinet is one of their many hand-planed pieces. Combining a rustic look with beautiful parquetry for visual and textural interest, the sturdy and heavily distressed cabinet is cleverly planed by hand to give that genuinely old look. It’s the kind of technique that takes years to perfect! Woodbridge Furniture Company makers are also masters at distressed furniture, with their hand-rubbed and waxed finishes. This lovely little Woodbridge side table with a dovetail construction drawer is crafted in solid wood and finished with a hand-rubbed distressed cherry veneer. It is not only a very practical side table (I can imagine it as a bedside table too!) but it looks great because the gently aged appeal is very charming. Whenever you buy distressed furniture, you don’t want the distressing to be too obvious otherwise everyone can spot that bad distressing a mile away and they know it’s a new piece. The best distressed furniture keeps everyone guessing! Here are more examples of beautifully distressed furniture on our website. Prepare yourself to be seduced! This entry was posted in Home Design Ideas, Learn History & Styles and tagged Ambella Home, antique inspired furniture, distressed furniture, expert craftsmanship, Jonathan Charles, Scarborough House, Woodbridge Furniture Company on April 18, 2017 by admin. If you’re looking for some home decor inspiration this spring, these recently published books offer plenty of beautiful ideas! This is the perfect time of year to start thinking about any interior design makeovers on your wishlist, so let’s see what’s new on the bookshelf. Although this gorgeous Greek Revival house in the hills of Millbrook, New York, looks like it was built a long time ago, it is in fact a new house created by architect Peter Pennoyer and his wife, interior designer Katie Ridder. 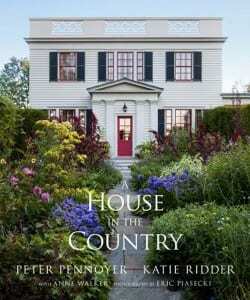 The illustrated book tells the story of how it all came together and how Pennoyer used historical and classic Greek Revival houses as a basis, but put his own updated twist on his house to suit modern needs. The landscape is drawn from the style of traditional English cottage gardens, and the book includes a pullout of the garden plan if you want to try a similar approach yourself! We import antique French furniture and antiques and home decor from other parts of the world too, so we are on board with the title of this book! 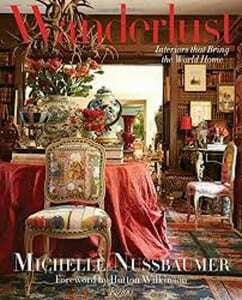 Designer Michelle Nussbaumer takes readers on a tour of interiors inspired by travel and furnished with antiques and other treasures from all around the world. I love the cover of the book. The featured spaces inside are influenced by travels in Paris, Rome, Africa, China and Mexico. The chapter titles, including Sailing to Byzantium, Finding Shangri-la, and Dreaming in Color give a hint of the exotic flavor of the book! Amelia Handegan is an interior designer based in Charleston, South Carolina, so she feels like a virtual neighbor! 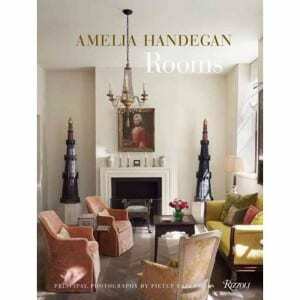 Handegan has restored many historic homes in Charleston and this new book presents an insight into her eclectic interiors. She likes to mix up Old World details, fabrics and finishes with antiques, cultural collectibles and modern furnishings. Houses in the book include a beach cottage on Folly Island, SC, a Blue Ridge Mountain rustic cabin and a refurbished 18th Century Virginian plantation house. Handegan has been on the House Beautiful magazine 100 Best Designers in America list and in the Robb Report Guide to the World’s Top 40 Interior Designers so here’s a chance to find out why! My creative juices are flowing already, and I hope you are ready to dig in for spring home decor inspiration too! Please tell us about any home decor projects on your list this year in the comments box – we’d love to hear about your plans. This entry was posted in Bookshelf and tagged books, design books, design inspiration, landscaping on April 11, 2017 by admin. I came across a reference to Farmhouse style furniture and decor while I was reading Home Accents Today. The article referenced this piece that talks about top home trends for 2017 according to Pinterest. We love the French Country Farmhouse furniture in our store and we have a good time browsing Pinterest too… just like everyone else who loves home decor! See our antique furniture and home decor Pinterest page here. The article said that the trend for rustic farmhouse interior styles is up 40% since last year because the look has us “feeling at home the second we walk through the door.” It’s true, and you can get a glimpse of what they mean with this lovely French Country Farmhouse settee with its blackwash finish and hand-woven rattan seat. Doesn’t this settee just whisper welcome at you, and invite you to come and relax a moment, leaving your worries behind? The comforting Farmhouse style gives a sense of nostalgia for an old-fashioned, simpler way of life before the hustle and busy-ness of today’s modern world. These painted French Country Farmhouse style dining chairs by Jonathan Charles give an idea of what I’m talking about. Doesn’t this dining room with its ladderback Farmhouse style chairs just make you want to go and kick back over a chatty meal with friends? The Home Accents Today article mentioned that the huge popularity of Joanna and Chip Gaines on HGTV’s Fixer Upper is also driving so much interest in the Farmhouse style. Let’s take a look at a few more examples from our own clients. Stephanie C. in Kernersville, NC. chose a French Country Farmhouse counter stool from our selection, and the look is perfect for her kitchen. Detailed floral wood carvings across the curvy chair rail and seat apron create a stunning decorative effect. The nice cabriole legs are typical of French Country style, and this stool also boasts a hand-woven rattan or rush seat. You can see more about Stephanie’s gorgeous French Country Farmhouse kitchen here. Talking of kitchens, we think that this charming new Jonathan Charles Country Farmhouse painted shelf unit would be a wonderful addition to a kitchen as a basis for creating a Farmhouse look. There are so many ways you could decorate those shelves, don’t you think? And what great storage too, including the drawers and pegs to hang mugs, jugs, or towels. Our customer Eric purchased this handsome new French Country Farmhouse sideboard in blackwash finish, beautifully crafted using traditional joinery techniques. You can see more photos of how it looks in his house and also glimpse his fantastic views from his porch in our French Country Sideboard customer spotlight. We’d love to see any photos of your Farmhouse decor or tell us what you think about the look in the comments box! This entry was posted in Home Design Ideas, Learn History & Styles and tagged Farmhouse Style, French Country, French Country cabinet, home decorating trends, pinterest, rustic decor, trend report on April 6, 2017 by admin.